Ancient Egyptian names had cultural and religious significance to them since it was believed that names represented life, beauty, and association with gods. Various factors were considered while naming a child. For instance, the devotion of the child’s parents to certain gods or locations could play an important role. Similarly, the particular era in which the parents were living could also influence the name of the child. At times various epithets were used along with the names to distinguish people with the same names, for instance ‘Aa’ which means eldest or ‘Nedjes’ which means smallest. One of the most important things to consider before naming a child was the meaning of the name. Nouns and adjectives with appropriate meanings were most commonly used names, for instance Neferet which means ‘beautiful woman’, User which means ‘strong’, and Nedjem which means ‘sweet’. Nicknames were common which could imply personal habits or anything else. Names invoking gods were also given, for instance a common name was Ahmose which means ‘son of Iah’, a reference of Egyptian god Iah. A wide range of ancient Egyptian names were prevalent and these varied from place to place as well as from era to era. Many of these names have survived through history. What’s common between these common ancient Egyptian names is that special attention was paid to the meanings of the names. Mainly, the names were chosen as references to gods or places and sometimes simply signified a quality. Some of the common ancient Egyptian names included Baraka which meant blessing, Akhon which meant eagle, Kemosiri which meant black Osiris, Meti which meant righteous, and others. Ancient Egyptian names for gods often signified their powers. For instance, Isis was one of the greatest goddesses in ancient Egypt and the name literally meant ‘she of the throne’ to signify her greatness. Similarly, Ammit was a god of punishment and soul and the name meant ‘devourer’ or ‘soul-eater’. Other famous ancient Egyptian names for gods included Amun which at one point in Egyptian history was considered the ‘King of the Gods’, Anubis who was the guardian of the underworld, and Horus who was the god of the sky. Names in ancient Egypt were often included by their religion and their gods. Various terms and names were used to signify the greatness and importance of the Pharaohs. This was in addition to actual ancient Egyptian names for the Pharaohs. Since Pharaohs were considered descendants of gods, ancient Egyptian names for them also had references to gods. The name of a famous Pharaoh, Ahmose, meant ‘son of Iah’. 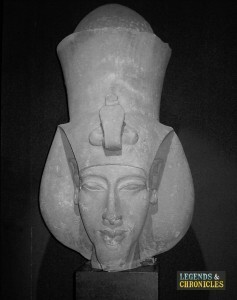 Similarly, Akhenaton was another famous Pharaoh whose name meant ‘spirit of Aton’, Aton being the Egyptian god of sun. Some other famous Pharaohs were Amenhotep whose name meant ‘peace of Amon’, Rameses which meant ‘son of Ra’, and Cleopatra which meant ‘glory of the father’. The ancient Egyptian names for males could signify anything from the status of the person to relationship with gods or simply a reference to some place. For instance the male name ‘Khaemweset’ meant ‘He who appeared in Thebes’. Similarly, the names could also reference various animals which were considered sacred in ancient Egypt. One such name was ‘Akhon’ which meant eagle. Other common ancient Egyptian names for males included Adjo, Baki, Djal, Iabi, and others. It was also common to use various frank nicknames, particularly for boys. Many ancient Egyptian city names have come down to us from scrolls, paintings, and other writings. Sometimes, names were chosen according to the location and weather of the place. Names of Pharaohs could also be given to towns. One of the most famous ancient Egyptian cities was called Bubastis which was located along the River Nile. This town was also the capital of its province. Other famous ancient Egyptian names for cities included Apis, Bilbeis, Avaris, Buto, Cairo, Dahshur, Helwan, and others. Ancient Egyptian civilisation is unique in a sense that various queens ruled as Pharaohs and thus enjoyed status of supreme importance. Important ancient Egyptian names of queens during the First Dynasty include Neithotpe, Berenib, Hent, Herneith, Merneith, and Betresh. Ancient Egyptian names for queens during the subsequent dynasties include Heterphenebty, Meresankh, Hetepheres, Nefertkaw, Senti, and others. But the most popular ancient Egyptian queen name is definitely Cleopatra who was also the last active Pharaoh of ancient Egypt. Just like ancient Egyptian names for men, special attention was paid to the meanings of the ancient Egyptian names for women, for instance, female names could be reference to goddesses or places or simply have some other acceptable meaning. For instance, one popular ancient Egyptian name for women was Amisi which means flower. Another popular name was Banafrit which means beautiful soul. Some other popular ancient Egyptian names for females include Djeserit which means holy woman, Iris which means ‘fashioned by Isis’, Kebi which means ‘honey’, Miu which means ‘softness’, and others. Ancient Egyptian names for kids were similar to the names of males and females but the use of nicknames was common for children. For instance the nick ‘Mery’ was generally used for such names as Meryneith, Merypath, and Meryamun. Similarly, nicknames such as Kyky which means monkey and Tahement which means Queenie were also prevalent among ancient Egyptian names for kids. Other than nicks, various epithets were also used for kids. For example, Aa meaning eldest was used for eldest kid while Nedjes meaning small was used for the youngest child. Ancient Egyptian names had special social and religious significance and attention was paid to their meanings. Various names were associated with gods and were thought to bring the protection and blessings of god. Some epithets were specifically used for Pharaohs while nicknames were common for children. The Same trend of naming people after goddesses was also used for females. As for gods, ancient Egyptian names for gods signified their special powers. Ancient Egyptian names sometimes also signified the status of a person or the place from where that person hailed.